“that as part of a major new initiative to restructure its fleet the trust is buying four new 22mtr yachts and selling one of its brigs. I posted a comment for confirmation but as of this writing I haven’t received a response. I visited the TSYT website and couldn’t find anything and an Internet search was also unsuccessful. Well, this new media works in strange and wonderful ways. Decision was only made last Friday. I find this to be very disappointing news. The Tall Ships Youth Trust, which was formerly known as the Sail Training Association, has a long and rich tall ship history. They launched the first Tall Ships races in 1956 and founded the International Sail Training Association, the predecessor to Sail Training International, the current organizers of The Tall Ships Races. For years they operated the schooners Sir Winston Churchill and the Malcolm Miller and earlier this decade they replaced those vessels with two beautiful brigantines, the Prince William and Stavros S. Niarchos. 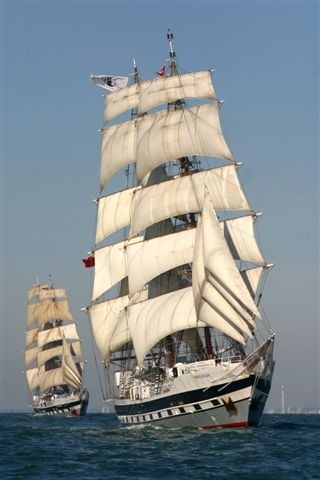 The Tall Ships Youth Trust is a registered charity dedicated to the personal development of young people aged 16 to 25 through the crewing of Tall Ships. I can appreciate how terribly challenging it can be own and operate a even single ship of this size; however, this is the organization which really started the whole Tall Ships movement and remain to this day one of the industry leaders. Over the years, thousands of young people have sailed and grown as a result of their experiences aboard TSYT / STA tall ships. It will be interesting to watch how they react to this news. With no disrespect to the four “yachts” that will try to replace the one brig, it just isn’t the same experience. Deep water sailing on both yachts and tall ships can be life changing for young people; however, tall ships offer a deeper, richer challenge. No one forgets their first (or last) time going aloft to furl a topsail or topgallant. The spider web of lines and rigging and the number and variety of sails presents a real challenge to the newly initiated. Living and working with 25 or more other young people in a confined space over a extended period of time teaches so many valuable life lessons that have nothing to do with sailing. There’s a valid reason why many militaries around the world still use tall ships to train their elite officers even though no country has fought a war under sail for over 100 years. Sorry, TSYT, four yachts will never equal one brig! Bad decision. Maybe the USNA can finally get themselves a square-riggged vessel for sail training in addition to the small boats and yachts being used currently.